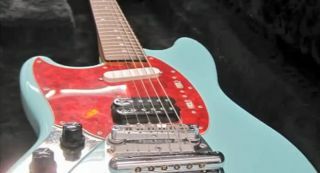 A Hagstrom Deluxe solidbody electric guitar once owned by Nirvana frontman Kurt Cobain is up for auction on eBay. About 17 hours ago, Nirvana—or, to be more precise, the person who runs the long-defunct band's Facebook page—was forced to shut down a rumor thatKurt Cobain is alive and well and living in Peru. Hear Kurt Cobain's Mixtape from 1986, "Montage of Heck"
Below, check out a video of Nirvana performing "Scentless Apprentice" from their December 13, 1993, Live and Loud concert at Seattle's Pier 48.